Calling all women runners and walkers! You're invited to join KC Express, a group for women who love to run and walk together. Since 1982, our non-profit club has helped women find new friends, new races, better fitness, and active fun. Join today! Poster Party! In place of our usual First Tuesday meeting, come help create the fun and inspiring “Momism” posters that line our race course. It’s a great way to help with the MD5K! Light dinner provided. RSVP Christy if you can come so we have enough food! Whether your goal is to run or walk your first 5K, 10K, or half marathon–or to improve your time in any distance–KCE has a training program for you. All of our training groups focus on building fitness gradually and safely, in a fun and supportive atmosphere. 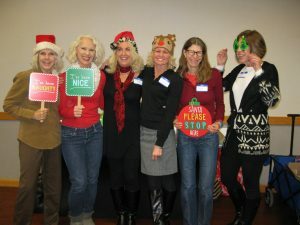 It’s our annual Holiday Party on Tues, Dec 5, 7-9 pm! We will welcome the new officers for the coming year, and also reveal this year’s Pacesetter Award winner. Join us to celebrate the season with KCE! Our officers have wonderful plans for the coming year. Sign up now or renew your membership online or check the membership page for a print-and-mail form.